Create a professional video, directly from your 3D pool and landscape design software. It’s never been easier or faster to edit your own videos, with revolutionary tools you can master with simple clicks. First: Simply select important design features in your project, and set the viewpoint on them. Your video storyboard will be created and saved automatically, along with any day-to-night transitions and artistic effects you choose. Bring an incredible new level of realism to your 3D outdoor living presentations with custom sound objects. With streamlined tools, select and add custom sound files anywhere in your project. You can demonstrate outdoor speaker placement, the ambiance of nature, a light breeze, bubbling water, or even add your own narration with a simple click. Delight your client by revealing the tranquility of their backyard escape and show how the gentle sounds of a pool will make neighborhood noises fade away. Beautiful before and after comparisons, simplified. With the uniquely imagined Photo Mode, you can save multiple views of your design in a single project. Today’s hardscape design software makes it easier than ever before to change quickly between views as you make revisions to your design. To achieve that perfect shot, you can save individual artistic settings to each frame, and save time-of-day settings. Once you’ve found your best shots, leave your client speechless with JPG or PNG images in up to 8K resolution. Simplify your social media workload and join the ranks of the most successful designers. Let the powerful media tools in Pool Studio and VizTerra help you create stunning images and immersive videos that you can instantly share on YouTube, Vimeo, Facebook, Twitter, or even via email. 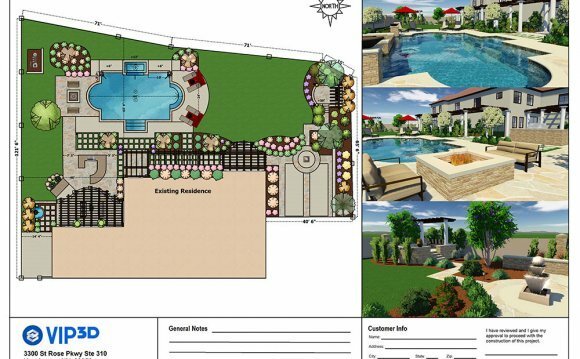 Whether you share in-progress shots or complete projects, you can use the easy pool and landscape design software tools to help you market your ideas, build your brand, and grow your business. All without leaving your design project.